Editor’s Note: Part I of this article was published in the previous issue of the Alchemy Journal. In this Part, the authors use the information and approach that was previously presented to review the case for several individuals who have been presented as possibly being Fulcanelli and then present their startling candidate for the true identity of the mysterious Master Alchemist. Why is Champagne Often Mistaken for Fulcanelli? The most popular version of Fulcanelli’s identity originated with Robert Ambelain, who carried out a considerable amount of research during the early 1930’s and claimed that Fulcanelli was none other than the painter Jean-Julien Champagne (1877-1932). This same conclusion was reached by Geneviève Dubois in Fulcanelli dévoilé (1992). Ambelain’s identification of Fulcanelli as Champagne was largely based on interviews with Jules Boucher. Boucher and Gaston Sauvage became Champagne’s disciples in 1922 and Boucher provided Ambelain with information which seems to indicate that Champagne had indeed played the role of Fulcanelli, or more correctly, that Champagne himself had claimed to be Fulcanelli. It is known that Boucher dedicated his book Manuel de Magie Practique (1941) to his ”master Fulcanelli.” The difficulty is not whether Champagne claimed to be Fulcanelli (he certainly did), but rather whether this was the actual truth or not. The fact that Champagne introduced himself as Fulcanelli proves nothing in itself. In addition to Boucher’s testimony, Ambelain also interviewed Jean Schemit, the publisher of Le Mystère des Cathédrales, who told him that a stranger had visited him during 1926 who had argued for the relationship between gothic architecture and hermetic philosophy. Some weeks later the stranger, accompanied by Canseliet, returned and introduced himself as Champagne. Schemit had noticed that Canseliet always treated Champagne with great dignity and always used the epithet “Maître” (master). Because of these observations, Schemit concluded that Fulcanelli and Champagne were the same person. In the book Fulcanelli Dévoilé, Geneviève Dubois presents arguments that are similar to those of Ambelain. The only unique new finding of any significance is the interesting revelation of Champagne’s previously unknown relationship with the Egyptologist Réne Schwaller de Lubicz. The information reveals that Champagne had told Lubicz that he was Fulcanelli. Lubicz subsequently made a red-pencil drawing of Champagne, which bears on its back the inscription “Fulcanelli.” Similarly, in the book Al-kemi by André Vanedenbroeck, there are numerous indications that also clearly demonstrate that Lubicz believed that Champagne was Fulcanelli. For example, on page 76, Lubicz states that Fulcanelli was 10 years older than himself which is a perfect match for Champagne who was born in 1877 while Lubicz was born in 1887. In addition, on page 131 of Fulcanelli Dévoilé, Dubois presents several dedications from Fulcanelli to Lubicz which are obviously in Champagne’s own hand. There is a similar dedication in Jules Bouchers copy of Le Mystère des Cathédrales which is in Champagnes hand but signed as “Fulcanelli” (Les Cahiers de la Tour Saint-Jaques, number 9). All this makes it perfectly clear that Champagne did indeed often present himself as “Fulcanelli,” but this does not necessarily mean that he actually was Fulcanelli. But why would Champagne pretend to be Fulcanelli if he wasn’t? Was it because he personally sought personal fame and glamour, or is it possible that there was another more profound motive? There is indeed a possible motive that may explain many of the unusual contradictions that occur throughout this strange play-like story. Champagne may well have convincingly appeared to be Fulcanelli to many, because his part in the play might actually have been to act as Fulcanelli on behalf of Fulcanelli’s own considered motivation. By revealing himself as Fulcanelli to people such as Jules Boucher, Gaston Sauvage and Schwaller de Lubicz, he would have been able to draw attention away from the actual Fulcanelli thus helping to preserve his true identity. It is also possible that the double visit to the publisher Jean Schemit mentioned earlier was not just a whim, but a carefully planned strategy in order to set out a red herring and hinder speculation. Champagne also provided another curious clue when he completed his last emblem in Le Mystère des Cathédrales (which unfortunately was taken away from the English version). This shows a knight hiding behind a helmet and a heraldic shield surrounded by the phrase: UBER CAMPA AGNA. Phonetically, this may be read as: “Hubert Champagne”. According to Jules Bouche, Champagne’s first name was indeed “Hubert”, a name which he got from his father. This clue was noticed by Ambelain as long ago as 1930, who obviously saw this as further evidence for Champagne’s identity as Fulcanelli. 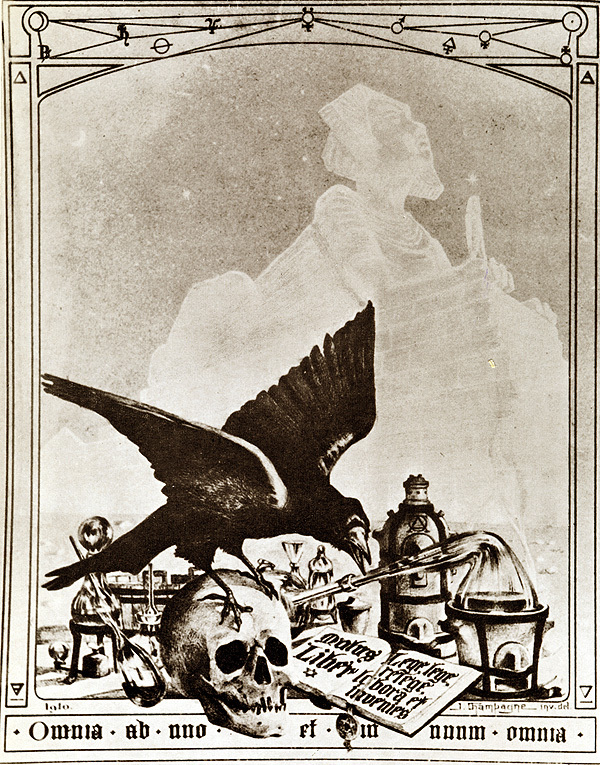 It is equally plausible to assume that this was only Champagne’s clever way of adding his final touch on his contribution as an illustrator of Fulcanelli’s book. Or it may have been done with the specific intention of spreading even further the belief that Champagne was actually Fulcanelli. Let us now return to the mysterious Mr. Devaux, who we recall as the person administrating the contacts between Fulcanelli and Canseliet after Fulcanelli departed in 1922. Who he was may help shed some light on Champagne’s peculiar behaviour, of which we will have more to say below. Briefly then, Mr. Devaux, whose first name was Gaston, was none other than Champagne’s own brother-in-law! So we see that after 1922 all the contacts between Canseliet and Fulcanelli went directly through Gaston Devaux, Champagne’s brother-in-law. It is also very interesting to note that Dubois, in Fulcanelli Dévoiléstates that all of the letter correspondence between Champagne and Lubicz was kept secret by cleverly routing all of Champagne’s mail directly to Devaux’s residence rather than to the apartment in which he lived. Thus Champagne managed to keep his relationship with Lubicz completely concealed from his other friends, such as Canseliet, Jules Boucher and Gaston Sauvage. This strange action may have been part of an involved strategy to keep his more private and important work secret (for example, Lubicz and Champagne worked together on reproducing the red and blue glass of Chartres). At the same time, he may have been trying to encourage Lubicz in the belief that Champagne and Fulcanelli were the same identity, without also causing any confusion in the mind of Canseliet since Canseliet knew that Champagne was not Fulcanelli. In fact, Canseliet often ridiculed this type of speculation by others for the rest of his life. This suggests that Canseliet himself may have been the victim of some mystification. On this point Dubois also agrees, because it is evident that Champagne kept his relation to Lubicz secret from the eyes of his other friends, including Canseliet. The curious reader is directed to Les Cahiers de la Tour Saint-Jaques (number 9) in which Robert Ambelain’s complete argument is to be found, along with a long reply by Canseliet in which he challenges and rejects all the points that attempt to identify Champagne as Fulcanelli. One must carefully keep in mind that Canseliet’s writings and interviews will always remain as the primary source of information for this type of research and, if one considers him to be a liar, then, it would seem very problematic to draw any positive conclusions about Fulcanelli’s identity whatsoever. The suggestion that Champagne may have deliberately assisted Fulcanelli as an agent to help secure his private identity may well encourage some of our readers to add our names to the growing list of conspiracy-lovers, but we wish to emphasize that this is only a hypothesis based on supporting evidence. It cannot be denied that Champagne attempted to make certain people believe that he actually was Fulcanelli and it would be remiss for us not to consider alternative motives for this strange behaviour other than just a simple attempt to impress others. If that was so, then why was Champagne’s own brother-in-law given the highly trusted role of acting as a personal secretary to Fulcanelli? Further evidence of Devaux’s fraternal closeness to Fulcanelli can be found. According to Dubois in Fulcanelli dévoilé, page 122, Gaston Devaux possessed an exact replica of the golden baphomet ring, which Fulcanelli, as well as Champagne, is said to have worn. One may perhaps ask: was this the sign for their secret pact? Perhaps we will never know. It is undeniable that the person behind the pseudonym of Fulcanelli wanted to remain anonymous forever. So, if the intention was to disappear and cover all trails, what would be better than adapting a pseudonym and also finding a person who would willingly act at being that person? All sources confirm that Jules Boucher and Gaston Sauvage became Champagne’s disciples in 1922, during the exact same year that Fulcanelli departed. Obviously, Jules Boucher could not suspect any other candidate likely to be Fulcanelli other than Champagne because at that time the true Fulcanelli had already departed! Another popular argument that Champagne was Fulcanelli is derived from the witness lady Labille, the door-keeper of 59 bis Rochechouart where both Canseliet and Champagne had lived in a small apartment. She said that only three people ever came to visit Champagne: Canseliet, Jules Boucher and Gaston Sauvage. But one must note that Canseliet and Champagne only moved to 59 bis Rochechouart during the early part of 1925 – three years after Fulcanelli’s departure. So this is not a reliable argument that Fulcanelli must have been one of these persons. One may therefore consider the strange actions of Champagne and Gaston Devaux as a carefully planned plot whose purpose was to lay a smoke-screen to cover the traces of the true Fulcanelli. Or one may consider the behaviour of Champagne as a vain attempt to create a mystical shimmering around his personality. It is up to the reader to decide. But what remains quite certain is that Champagne’s profile does not in any way match the few facts that Canseliet left regarding the secret identity of his master Fulcanelli. He was born in 1839. He had a strange, eccentric appearance. He was trained as an Engineer. He was familiar with Paris. Fulcanelli participated in the war of 1870-1871 between France and Germany. He had a dignified, noble face with a beautiful smile. He wore a “baphometic ring” of transmuted gold and of Templar origin. Using similar methods of research, logic, deduction and elimination, both Christer Böke and John Koopmans independently arrived at the very same unique conclusion. Christer was first to arrive at the conclusion, while some time later, John’s own rapidly narrowing research, focusing on a small list of French scientists/chemists, was almost immediately concluded when Christer pointed out the vital clue, Fulcanelli’s year of birth. Our first task was to prepare a list of well-known French scientists and chemists born during the 1800’s. This produced a list of several dozen names. The next task was to isolate those who were specifically born in the required year, 1839. This immediately resulted in a single name: Comte Louis Marie Hilaire Bernigaud Chardonnet de Grange, who was born on May 1, 1839 (Mayday). Imagine our surprise when we also discovered that he died in Paris, on March 12, 1924! This satisfies the very restricted condition that he died (“departed”) either in 1923 or 1924, and possibly in the vicinity of Paris. Thus Chardonnet immediately passed the two most critical criteria in our list of requirements. All that remained was to determine whether the other characteristics matched the profile. Chardonnet was born into an aristocratic family at Besançon, and used the title “Count.” This satisfies the requirement that he was a French aristocratic. Chardonnet trained first as a civil engineer at the École Polytechnique, Paris. This gave him a good background in the architectural principles expressed throughout his books and places him in Paris, giving him the required familiarity and access. This is pronounced, in slang of course, “soufre et potasse pour l’X.” [Translators note: literally sulphur and potassium for the X, but in French slang it means ‘suffer and swot up for the school’.] (The Dwellings of the Philosophers, p. 198-9). One may ask: how did Fulcanelli know about this somehow odd and very particular tradition, unless he had been very familiar with the student life of that school? If Fulcanelli himself had been at student at the School, he would naturally have came across this kind of information. As we have already stated, Hilaire Bernigaud Chardonnet was a student of the Polytechnique school which he entered during 1861. 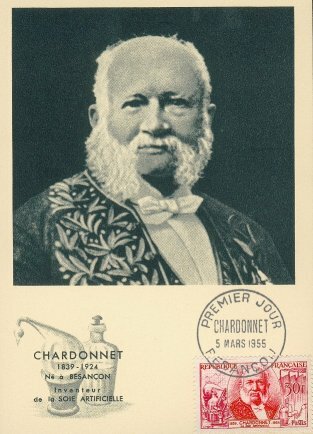 Chardonnet worked directly under Louis Pasteur, who was studying diseases in silkworms at the time. This work inspired Chardonnet to seek an artificial replacement for silk which he first patented in 1884. This gave him an exceptional background in theoretical and practical chemistry and a recognized standing as a respected and knowledgeable chemist, the same type of background that Fulcanelli possessed. Chardonnet participated in the war of 1870-1871 between France and Germany, just as Fulcanelli was said to have done. During the war, Chardonnet was at Vernay which, at the time was not mobilized, but on his initiative, a national guard was established and Chardonnet was promoted to a Captain, and later Major of Charette. Ambelain’s identification of Fulcanelli as Champagne was largely based on interviews with Jules Boucher. Boucher and Gaston Sauvage became Champagne’s disciples in 1922 and Boucher provided Ambelain with information which seems to indicate that Champagne had indeed played the role of Fulcanelli, or more correctly, that Champagne himself had claimed to be Fulcanelli. It is known that Boucher dedicated his book Manuel de Magie Practique (1941) to his ”master Fulcanelli.” The difficulty is not whether Champagne claimed to be Fulcanelli (he certainly did), but rather whether this was the actual truth or not. Although we feel that we have hereby established a strong and supportable basis for the link between Fulcanelli and his possible identity as Chardonnet, this unique theory is still in its infancy and could benefit from further academic research. Because of time and resource limitations, there are still many details pertaining to this theory that remain to be more fully researched and/or verified. For example, the acquisition of a detailed biography of Chardonnet could provide additional facts, characteristics or circumstances that may possibly solidify the link between the man Chardonnet and the pseudonym Fulcanelli. Although we feel that we have hereby established a strong and supportable basis for the link between Fulcanelli and his possible identity as Chardonnet, this unique theory is still in its infancy and could benefit from further academic research. Because of time and resource limitations, there are still many details pertaining to this theory that remain to be more fully researched and/or verified. For example, the acquisition of a detailed biography of Chardonnet could provide additional facts, characteristics or circumstances that may possibly solidify the link between the man Chardonnet and the pseudonym Fulcanelli. Also, an examination of Chardonnet’s notes and writings may reveal a particular style similar to the style used by Fulcanelli in his books. In addition, in Alchimiques Mémoires in La Tourbe des Philosophes (May 12, 1979), Canseliet reveals that Fulcanelli’s residence was situated close to the Temple de l’Amitié. The house is described as having 8 rooms and 12 windows and containing an underground laboratory. A researcher could investigate whether any of Chardonnet’s residences, while he stayed in Paris, matched the description and general location of the residence where Fulcanelli stayed. John Koopmans and Christer Böke encourage others to continue with this line of research and to share with us any further credible evidence that may either support or refute the theory as developed. For anyone willing to contribute any additional credible findings relating to this theory, please contact both of us at the following email address: Fulcanelli_research@yahoo.com . Egypt is well known for being the land of transformation. The word Alchemy comes from the ancient Pharaohnic name for Egypt “Al-chemia” meaning the fertile black soil. Al-chemia Remedies are a new line ofenergetic remedies prepared in Egypt. They are composed of the Egyptian Flower Remedies and Sacred Sites Remedies. These remedies work as environmental essence as well as flower essence. Egypt is a perfect location for making powerful remedies. Not only is it one of the world’s power points but the strong sun is conducive to making exceptionally strong remedies. Remedies are prepared by potentizing flowers, or a site, using sunlight as the catalyst for shifting the matrix of the water. Egypt with its abundance of potent, unobscured sunlight, is the perfect place for making powerful remedies. In making Flower Remedies only the flower heads are used. Rudolph Steiner’s work with plant signatures indicates that the flower is the most spiritual or etheric part of the plant, which is why the flower, rather than the whole plant, is used for making Flower Remedies. Being that these particular remedies were made in powerful energy centers, they are considered Environmental Remedies as well. The Sacred Sites Remedies are only Environmental Remedies; no flowers were used in their preparation. The energy of the surrounding environment is captured in the matrix of the water. This is a similar condition to what we would feel being at these locations since our bodies are mostly water. Flower Remedies are traditionally prepared by placing the flower heads on top of water. The sunlight shines through the energetic field of the flowers and is imprinted on the waters own energetic matrix, the bonds between the molecules. Water has the unusual property that it can change its matrix under certain conditions. The water will maintain the energetic pattern of the substance being potentized even after the substance has been removed. There need not be any physical substance present to retain the energetic pattern, which is very useful when using substances or plants that might be considered toxic. This Divine property of water is what is utilized in making both Flower Remedy and Homeopathic preparation. The ability of water to shift its matrix under varying conditions is well documented by Dr. Masami Emoto in his book: Messages from Water. Please see his work for a more in-depth explanation. Egypt is well known for being the land of transformation. The word Alchemy comes from the ancient Pharaohnic name for Egypt “Al-chemia” meaning the fertile black soil. Al-chemia Remedies are a new line of energetic remedies prepared in Egypt. They are composed of the Egyptian Flower Remedies and Sacred Sites Remedies. These remedies work as environmental essence as well as flower essence. There are artefacts in Egypt dating back thousands of years that appear to have been used to potentize water with glyphs and sacred geometry. Given the Pharaohs highly developed knowledge of plants and vibrational medicine, it is very likely that they also had their own flower remedies, although no direct evidence has been found. The Pharaohs had small sculptures or statues engraved with symbols and hieroglyphs. The sculptures had a flat back with engravings on it that led down to a reservoir at the base where water could be collected. Water was poured over the symbols and collected in the cup at the bottom. The collected water was then used, probably imbibed, for healing. The water falling over the symbols would be similar to succussion (tapping), another method used for potentizing water, in which the imprinting is done by motion rather than sunlight. At the Temple of the Sun, there are large vessels that that look like huge pots carved out of stone. These vessels were probably used to potentize water with sunlight. Some intuitives believe that the water potentized in these pots was used for color healing. What was used as the medium to shift the matrix of the water is unknown but even ordinary water, potentized by the sun, is how “holy water” is prepared, so obviously it is not always necessary to use a substance to shift the matrix. During Islamic times the practice of potentizing water was also commonly used. Special coins were left to soak in water for a period of time. The water was then utilized. It is believed that the metal from the coins, probably copper, as well as what was engraved on the coins – usually prayers, blessings or the names of God – gave the water its healing properties. The first group of remedies to be prepared were the Flower Remedies. The majority of the flower remedies were prepared in August 2000. The number 2000 is an even higher vibration of the number 20, the goddess energy, and the number of creation. The last group of flower remedies, including the Easter Lily, were prepared “coincidentally,” on Easter of 2001. The flowers used to make the remedies were from a special garden that served as a temple for the flower Devas at that time. The Garden was on an island in the Nile south of Cairo, a sanctuary for the Devas. At the time the remedies were made, the garden emanated the High Priestess energy of Isis. It was a strong power point. Presently the energy has shifted and “the goddess doesn’t live there any more.” This was the first clue that the energies WERE shifting here in Egypt and somehow needed to be preserved. The Devas have moved on but not before giving us a gift in the form of remedies. Their energy has been captured in the matrix of the water. The garden is dormant now as the goddess makes her trip into the underworld preparing to emerge again in 2012. 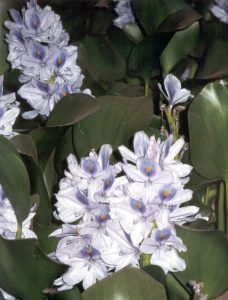 The Egyptian Flower Remedies have the distinction of having one moon preparation. 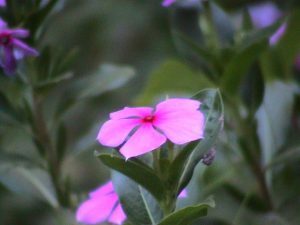 Maleket El Leil is a night blooming flower, so it is only fitting that the remedy be potentized at night. The flower gives off its fragrance from sunset to sunrise giving the plant itself lunar qualities. Because it speaks to us at night, a moon preparation was prepared during the full moon. The moon remedy has similar properties to the sun preparation but they are much more subtle in quality. The remedy is more lunar in nature, using reflected light to potentize the water rather than direct sunlight. The second group, the Sacred Sites Remedies, was developed in my continuing search for the goddess energy in Egypt after it had left the garden. This group holds the energy of the goddess/neter Hathor, mother earth. The word ‘neter’ was incorrectly translated by archaeologists as god/goddess. The word actually means archetype or aspect of nature. The Pharaohs were a shamanic culture; they used archetypes and totems to represent aspects or essences of nature. The word Nature, in almost all languages, comes directly from the word neter (originally ntr as there were no vowels in the ancient language) only the vowels are changes in each language; the consonants remain the same, n-t-r. Rather than being transmitted through a flower, the goddess energy is captured from a power point, an environment, rather than through Devas (messengers). Plants are dynamic and have relatively short life cycles, especially flowers, but crystals and rock are much more stable. Once the stones are programmed, the energy patterns can remain stable for thousands of year, perhaps longer. The last two remedies were prepared at two different sites in Egypt, both very significant power points. The first was at Dendara Temple, north of Luxor. Dendara is Hathor’s Temple. The remedy was made in the Chapel of the Union, May 2004. The Chapel is an open room on the roof of the temple. The room was originally used to potentize a statue of Hathor. What better place to potentize a Remedy than in the spot where the potentizing of Hathor’s statue had take place in ancient times? The second power point used is in Giza, at the Temple of the Sun. This temple has the only remaining alabaster altar in Egypt. 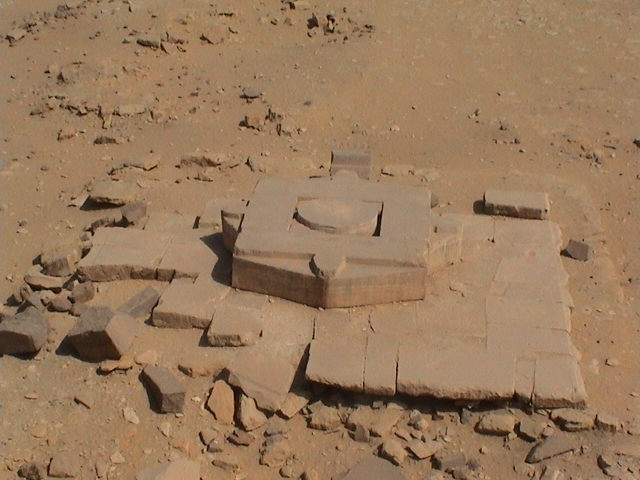 The altar is carved in the shape of the eight pointed star indicating a portal, probably to the star Sirius. This remedy was prepared on the altar on June 8th 2004 during the Venus transit. It was the final remedy prepared, the cycle was complete. Unconsciously this completed the set of 20 Remedies. The flowers and sites for the remedies were selected by inspiration. The whole project was done through guidance. Each remedy has its own individual significance as well as being part of a greater whole. Often these Divine patterns need a higher perspective to be seen, best to just watch as they unfold. The project began two years before the remedies were actually prepared, with research into all the ancient plants used by the Pharaohs. The Devas had other plans. They decided which remedies would be prepared in the end, and so it was. All the research was shelved and the lesson of surrender over mental will learned. Life is so simple when we flow. When these planets are somehow related (like Mars and Saturn being considered in the past as ‘evil’ or of detrimental, limiting energy), one might attribute this to the development of astrological understanding through time and consequently consider them of the same general limiting intention in light of the more current knowledge. But when the possibilities offered can not be so clearly grouped into one general aura or type of energy, one is left with no other solution than to make an almost random choice based more on the preference one might have for a certain author, publisher, tradition or period of the history of magic than on any other data, especially if one has limited previous experience in working with the problematic plants in question. They are alchemical remedies in the sense that the primary matter has been reduced to its pure “essence.” They retain only the higher mutable vibration rather than carrying the lower, denser properties. They are used as catalysts to aid in the transformational process. Because they are pure vibration they effect change on the highest or deepest level. In personal transformation we know that unless there is change on the cellular, DNA, vibrational level, the underlying pattern is still present and will continue to repeat itself. Because these remedies are pure vibration they resonate with that deeper/higher level aiding in complete transformation. Over time, in our universal alchemy, we have gone through many levels and stages, working deeper and deeper or on a higher and higher vibration depending on how you perceive the levels or stages of this hologram. We have worked through the densest level, the physical level, with the onset of modern medicine, operations, drug therapy. We have worked through the mental levels with our great philosophers. We explored the emotional realms with Freud, Jung and other great alchemists of emotion. Now, coming up on the dawning of the new age, it is time to finish this cycle in the last phase, the alchemy of the soul, or the vibrational level, returning us to the beginning, the essence. To do this we need tools that vibrate in that realm. There are 20 remedies and will not be any more in this set. The number twenty vibrates with the goddess energy, creation. The Remedies are present as couples, one in spirit and one in matter. They vibrate to the harmonics of the number vibrations of 1 through 10 as couples, completing the cycle and beginning again at a higher vibration, the Ouroboros; or as individuals in the base 20 system, Infinity. Once you have tuned into the Divine order, it is easy to use these correlations and apply the Remedies to any modality using base 10 or base 20 systems. For example, it can be aligned with the Mayan calendars intention for the day which is a base 20 cycle of creation. The Remedies can also be used to program crystals. The information on Universal Vibrational Harmonics will help to align the geometric orientation of the crystals with the Remedies. The Remedies are blended with essential oils and floral waters to prepare elixirs for personal use and to create sacred space or clear a space of undesirable energies. The possibilities are endless. Refer to the web site below for more information about using these remedies. During the time I was making the remedies I thought that this was a project that would go on indefinitely. I now KNOW that this is not true. These remedies are not just a flower, a place, but also a moment in time. They were prepared during an auspicious time, 2000-2004, the years from the new millennium leading up to the Venus transit. The last remedy was made during the actual Venus transit at the Temple of the Sun. These remedies are meant to be used during the Venus cycle, while the goddess goes on her journey underground. They can be used to assist us with the deep transformational work needed during this time to prepare us for the coming age. Once the shift occurs internally, we will be prepared for it to happen externally with her re-emergence in 2012. There exists a finite amount of mother tincture to prepare remedies but enough to serve their purpose. I believe when the supply is finished their need will end as well. They are not timeless they are meant for this period of time, the next 6 years. At that point, in the year 2012, another shift will occur and their usefulness will end or change. Perhaps we will not longer need messengers or external preparations to achieve fusion. Their purpose is to aid us through THIS major period of transformation, through our personal alchemy as we move to the age of Universal Gold. Leslie Zehr presently makes her home in Egypt. She was born in Perú and then resided in the USA for many years, where she received most of her education. She has spent the last 20 years in Egypt where she continues to reside. Based on her experiences at Dendara temple and throughout Egypt, she has developed a method for teaching sacred dance and esoteric wisdom. She does this both in Egypt and internationally. While in Egypt she also works as a Holistic Therapist. Leslie is a Hypnotherapist and Reiki Master with International Certifications in Homeopathy and Aromatherapy, a certificate in Sandplay therapy and a B.S. in Psychology from Virginia Tech, where she also studied Biochemistry. To aid in transformational work she does Tarot and Spiritual Astrology readings to help illuminate and define ones life path and lessons. Her Shamanic work with plants has led her to develop a line of Egyptian Flower and Sacred Sites Remedies which hold the energy of Egypt herself and can be used for transformational and alchemical healing. As an author she has published articles on Sacred Dance, Aromatherapy and the Egyptian Flower and Sacred Sites Remedies. She is presently completing a book on Sacred Dance and her journey to Egypt to be published in 2006. Her web site is: www.EgyptianFlowerRemedies.com . Visit the following web site for more specific information about using these remedies for transformational work:http://www.egyptianflowerremedies.com/UniversalVibrationalHarmonics.html .© Copyright 2006 – Leslie Zehr. A Compilation According to Eleven Bibliographic Sources Currently in Print. Editor’s Note: The previous issue of the Alchemy Journal featured the bibliographic research conducted by Johann Hasler with the publication of the first of a series identifying the planetary attributions of plants. That issue included the Sun, the first of the seven ancient planets of alchemists. In this issue, the series continues with the publication of the next three tables for the Moon, Mercury and Venus. The Introduction to the Series, Notes to the Tables and the Bibliographic Key, published in the previous issue, are included again for easy reference. During the several years in which I have been studying the magical and alchemical properties of plants according to the Wiccan and Hermetic traditions, I have several times faced at first the confusion, and later the frustration, of noticing that different sources assign different planetary attributions and correspondences to the same plants. One is often faced, while preparing a recipe or determining the components which are more appropriate for a certain working, with the possibility of a certain plant one wishes to work with being assigned to the influence of three, four, and sometimes even five different planets, according to different authors. In time I have come to accept this as a rather typical – and actually something to be expected – of spiritual sciences such as the Hermetic or Occult sciences, in which personal insight and individual discoveries through meditation, contemplation, or actual communion and communication with the spiritual essences or patron spirits of the plants are considered as valid sources of information as their pharmacological constituents would be. As a matter of fact several of the sources that cite the planetary attributions of plants are well aware of this fact and specifically list more than one planetary correspondence in the entries for some plants, pointing out this fact clearly in their prefaces, footnotes or correspondence tables. In this series of seven compiled tables of correspondences I do not wish to comment or establish a judgement over the validity of this and other problematic and strongly criticized epistemological approaches of the alchemy, magical herbalism, Hermeticism and other occult sciences. Yet as a complement to the existing qualitative data which such approaches yield, and which exist profusely, I present here some quantitative data, in this case of a bibliographical nature, so that a decision on the planetary correspondences of plants may be taken by the practitioner based on his or her preference of certain well-known authors in the field. I have gotten a hold of eleven recently printed sources that include if not whole tables at least a mention of the planetary correspondences of plants. They include a manual of evocation of spirits, a manual on planetary magic, a commented and edited re-print of Agrippa, a manual on the construction of talismans, two manuals on practical alchemy and several magical reference works, either specifically devoted to botanical magic, magical herbalism and magical aromatherapy, or of a wider scope. Apart from Donald Tyson’s reprint of Agrippa’s Three Books of Occult Philosophy (first appeared in Antwerp in 1531) all of the sources are modern, and most are still in print and easily obtainable through bookstores or the Internet. I have chosen these types of sources because the intention of this series is to be an aid to practicing spargyricists, rather than a bibliographical referencing source for historical studies. I have included the Agrippa not only because it is perhaps the single most important original source of contemporary natural magic (magia naturalis) but also because, as the rest of the sources I refer to, it is readily available commercially, having been reprinted by Llewellyn in 2004. All types, parts and components of plants (trees, shrubs, herbs, seeds, fruits, barks, roots, etc.) have been included in the same table. Likewise, what authors divide in their books into categories such as trees, herbs, oils, essences or incenses/perfumes, has been included in the same table. There is one table for each of the seven ancient planets of alchemy. The plants that different authors assign to each of the planets are listed here, alphabetically. After the name or variations of the name of plants, a list of superscript letters appears. The key is the first letter of the surname of author or authors of the specific books surveyed, listed below under “Bibliographic Key”. When there are variations in spelling but it is clearly the same plant, the bibliographic key specifies which author uses what spelling. For example, CamomileFA, D&Ph, Z, ChamomileW means that Frater Albertus, Denning & Phillips and Zalewski spell the plant camomile, but Whitcomb spells is chamomile. When there are variations in spelling, as listed above (camomile and chamomile, hellbore and hellebore and so forth), all variations have been listed, usually one after the other in the same line of the table, but sometimes also separately, in alphabetical order. No attempt of correcting possible errors or inconsistencies in this respect has been attempted; the tables simply refer to which book refers to what in what way. If Zalewski, for example, writes celadine while most other authors write celandine, this has been duly noted but not expurgated or corrected in any way. As these tables are thought as an aid for practicing spargyricists, they are designed as a practical directory for quick reference. This is why, for easier location of particular plants, some have been entered twice, always in alphabetical order. For example, black pepper appears both as Black pepper but also as Pepper, black. The same rule applies to all plants with composite names, or in the case when spelling varies so greatly as to warrant a different line in the table. A Agrippa Von Nettesheim, Henry Cornelius, The Three Books of Occult Philosophy: A Complete Edition (St. Paul, MN: Llewellyn Publications, 2004) , edited by Donald Tyson. Book I, chapters 23-29 pp.75-95. C1 Cunningham, Scot, Magical Aromatherapy: The Power of Scent (St. Paul, MN: Llewellyn, 1989), p. 166. C2 Cunningham, Scot, Cunningham’s Encyclopedia of Magical Herbs (St. Paul, MN: Llewellyn, 2002), pp. 271-273. C&C Cicero, Chic & Cicero, Sandra Self Initiation into the Golden Dawn Tradition, pp.281-282, 291. F Farrell, Nick, Making Talismans: living entities of power (St. Paul, MN: Llewellyn Publications, 2001) p. 171. FA Albertus, Frater, The Alchemist’s Handbook: Manual for Practical Laboratory Alchemy (New York: Samuel Weiser, 1974). J Junius, Manfred M., The Practical Handbook of Plant Alchemy: An Herbalist’s Guide to Preparing Medicinal Essences, Tinctures, and Elixirs (Rochester, VT: Healing Arts Press, 1993) , pp. 102-122. K Konstantinos, Summoning Spirits: The Art of Magical Evocation (St. Paul, MN: Llewellyn Publications, 2002), p.146. W Whitcomb, Bill, The Magician’s Companion: A practical encyclopedic guide to magical & religious symbolism (St. Paul, MN: Llewellyn Publications, 2001) pp. 467-472. Z Zalewski, Christine L., Herbs in Magic and Alchemy: Techniques from Ancient Herbal Lore (Saint Paul, MN: Llewellyn Publications, 1990), pp. 115-124. Across time and across the world, an ancient serpent cult once dominated mankind. Then a great battle ensued and Christianity stamped it’s authority on the face of the planet. Now, after years of research, the real religious history of the world can be told. In this new book, Philip Gardiner for the first time reveals the world’s most mysterious places were once sacred to the Serpent Cult. Secrets of the Serpent: In Search of the Sacred Past cuts across time and across the world, to reveal an ancient serpent cult that once dominated mankind before Christianity stamped out its authority on the face of the planet. The true “bloodline” of the Grail will shock you as you come to understand the untold religious history of our civilization. Gardiner is committed to the constant struggle to uncover the real history of mankind and the unraveling of manipulative propaganda, and has come up against many obstacles in researching this book. Yet his work has gradually gained the backing scholars around the world. The history and mythology of the so-called “reptilian agenda” and sensational stories of “alien visitations” in ancient times now has a solid opponent – giving answers for the many symbols and myths often confused by those who believe in such things. In Secrets of the Serpent, the author reveals the real “bloodline” spoken of by Dan Brown in the Da Vinci Code – it was in fact a serpent bloodline. Philip Gardiner is the international best selling author of The Shining Ones, The Serpent Grail,Gnosis: The Secret of Solomon’s Temple Revealed and Proof – Does God Exist? He has appeared in hundreds of radio and television programs worldwide speaking on religion and propaganda. He has infiltrated various secret societies and been initiated into Orders many people had thought were long forgotten. In The Serpent Grail he revealed a truth about the Holy Grail that gained the backing of academia, and now he lays bare the facts for us all to face in Secrets of the Serpent. I have accepted an offer to share the master of ceremonies position at the upcoming International Alchemy Conference along with Austrian chemist Hans Schimmer. Together we promise to keep things organized (as far as a group of alchemists can be organized!) and entertaining. We also share the presidency of the the Guild and have worked together now for over 30 years. I am really looking forward to meeting old friends, fellow alchemists, and students at this conference. Currently, we are looking for speakers in practical and laboratory alchemy, as well as historical and spiritual aspects. There are also several volunteer positions available that provide free admission to the three-day event. March 15 (the Ides of March!) is the deadline for submitting speakers and volunteer applications, so please hurry. The conference coordinator is Justin Riley and he can be contacted at info@alchemyconference.com . Complete information is available at www.AlchemyConference.com . The Alchemy Forum has been moved to a more secure site at www.AlchemyCode.com/Alchemy_Forum . The discussion board has sections for students in the Alchemy Home Study Program, the International Alchemy Guild, and other topics of interest to beginning and advanced practitioners. Former members are invited to return to this forum, which is going into its fifth year of operation. International best selling author, Philip Gardiner, now has his own weekly radio show. Gardiner, famous for his books The Serpent Grail, The Shining Ones, and Gnosis: The Secret of Solomon’s Temple. Airing twice a week, Mondays 10pm to 11pm and Wednesdays 8pm to 9pm (UK Time) on www.nettalkradio.co.uk. Writers Wanted! The Alchemy Journal is always looking for articles on any aspect of alchemy, including biographies, historical material, practical laboratory work, spagyric recipes, philosophical pieces, poetry, experiences in personal transformation, spiritual insights, Hermeticism, Gnosticism, book reviews, film and video reviews, website reviews, artwork, etc. Please submit your material or queries via email to our editor Duane Saari at alchemyeditor@yahoo.com. October 5-7, 2007. International Alchemy Conference in Las Vegas, Nevada. The International Alchemy Guild (IAG) is currently organizing what looks to be the largest gathering of alchemists and alchemical practitioners in 500 years. The goal is to represent all aspects of alchemy, including the practical and spiritual paths, East and West, and modern perspectives such as transpersonal psychology. The event is scheduled to take place over the Columbus Day weekend, October 5-7, 2007, in Las Vegas. Complete information can be found at www.AlchemyConference.com . This is a tale of a centuries old manuscript lying in a vault and forgotten after being saved from the WWII bombing of London; its rescue from oblivion by a professor working at a university in the Indiana; a translation of part of the document written upside down in Latin; and the resulting revelation about the formation of the principles of gravity. A press release issued in Bloomington, Indiana a little over a week ago contains significant news about alchemy for practitioners, students and others interested in the Art. While the December 14 media release from Indiana University that announced the availability of a new online manuscript as part of its Chymistry of Isaac Newton Project may not have raised many eyebrows, it did raise the level of our understanding of the role alchemy played in the creation of the foundations of modern science. The significance of this manuscript, as well as this story, lies in what it reveals about Newton’s development of his idea of gravity that is the foundation of much of modern physics. Newton used his knowledge and understanding of the alchemical principles of his time in the development of his theory of gravity. Alchemists believed that space was not a void and that an ethereal substance – the ether – existed between the center of earth and the sun. This substance, invisible to the naked eye, had several effects however including combustion and the creation of metals within the earth. In his manuscript, Newton used his belief in this alchemical concept of ether to develop his understanding of why things fall – like the legendary apple he saw drop from the tree – and wrote that such events happened because ether pushed all matter toward the center of the earth. While the concept of ether was discarded during the scientific revolution of the century following the one Newton lived in, it remained dormant until it was resurrected recently in the “new” theories of dark matter that are now believed by most scientists to explain the still mysterious force of gravity and other events we see through our telescopes and microscopes but do not fully comprehend. So, then, what is the moral or purpose of this tale? It is to remind us that alchemical principles are part of the foundation of our world as we see it and experience it now. The story also raises the question: If alchemy contributed to our modern understanding of how the force of gravity operates, what other knowledge that we use today comes from the work of alchemists and what other understanding about our world and ourselves can we derive from it? Look for more information about our increasing realization of the significance of alchemy to our daily lives in future issues of the Journal.